Heat a large skillet on medium-high heat. Season each side of the burger patties with salt and pepper. When skillet is hot, cook each side of the burger for 4-5 minutes or to your desired doneness. Top with feta cheese during the last few minutes of cooking time. 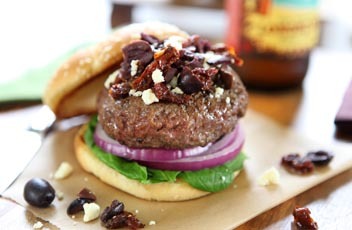 To assemble the burgers, place the burger on the bottom half of the toasted bun, next add olives and sundried tomatoes. Top with spinach and red onion and serve hot. Chef’s Note: For a Greek burger spread, try mixing the feta cheese into some Greek yogurt, add some fresh mint and smear onto the burger buns.